I had to get this recipe up the very next day because it is absolutely delicious. If you’re a lamb lover, this is a great way to get your lamb fix without breaking the bank. The rolls are a new find that I was so excited to discover. I try to avoid bread as much as possible, but every once in a while I like a good burger, roll and all. Now, I can have my roll and eat it too. They’re called Arnold Select Sandwich Thins. I bought the mulit-grain variety. I also saw whole wheat. 100 calories each. What I love about a thin, crisp roll is that the meat is still the star attraction. So, let’s get back to the star. This recipe comes from a great website called Chow.com and there’s not one thing I have tweaked or altered like I normally do. It is fabulous as is. Oh, the only thing to watch is the cooking time. Peter, my grill guru, says the grilling time was really 10 minutes total, not each side. Just keep an eye on them. I like my lamb a little pink in the middle. They were done perfectly at 10 minutes total on my grill, which does run hot. Chow recommends serving the burgers topped with a Cucumber and Cumin Yogurt Relish. I did make the relish, but I was not a fan of the taste. Peter liked it, but decided he didn’t want to top the burger with it. He had it as a side. 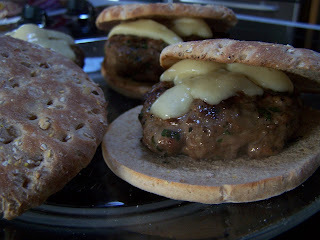 We topped each burger with Gruyere cheese. It worked very well. I also love Pepper Jelly with my lamb, so I smeared on Pepper Jelly and it was perfection. Everyone decided to follow my example and loved it, even my 10 year old. If you love lamb, you’ve got to try this one. Combine all ingredients except bread and yogurt relish in a large bowl and mix until evenly combined. Form into 4 patties. Heat a grill pan or outdoor grill to medium heat. Once the grill is hot, cook burgers about 10 minutes per side, or until juices run clear and patties are firm to the touch. Place lamb burgers on buns, top with relish, and serve.